GM is setting a new record with one of their iconic muscle cars. That’s right, the Dodge Demon is in fact the world’s fastest production car. Dodge throwing a gosh-darn gauntlet for the automotive world to take notice is quite something! The ominous monikers implies devilish power, the kind that lets Dodge up and declare themselves the king of what they call the “Muscle Brotherhood.” If that new tagline seems fit for a FAST AND FURIOUS movie, you’re right. None other than movie star Vin Diesel has become Dodge’s pitchman and the F&F actor was onstage the New York Auto Show to host the debut of Dodge’s demonic delight. The occasion was even given one hell of an atmosphere with tire smoke-filling the air. Dodge loves their American muscle. When they made a 707-horsepower Hellcat few years ago, any other auto maker may have scoffed. After all even in the 2010s…who really needs a car with more than 700 horsepower? Even if you wanted one, chances are you’ll never have occasion to use that power. Many trades assumed it would flop. This trades bit the dust when the Hellcat sold remarkably well for a vehicle in its class. More power: The Demon is possessed by the most powerful V8 ever fit to a production car, making 840 horsepower and 770 pound-feet of torque. Dodge representatives claim that the monster has one of the most forceful launches of any of their production cars, pulling 1.8g off the line. Infused with some clever trick suspension that shifts half a ton of weight to the back wheels for the launch, the Demon will lift the front wheels off the ground for a Guinness-certified 2.92 feet at takeoff — another first for a production car. No wonder they got Vin Diesel to talk it up. The Demon can be purchased with or without passenger or rear seats — to save weight and perhaps a few high-speed fearing souls from temptation. The option was scientifically proven, to drop its quarter-mile time a little further. It also comes with positively sinful, barely street legal, ultra-sticky 315/40R18 drag radials. Dodge reps refer to them as the world’s only “purpose-built street legal production drag car” and “a lady in the streets, but a freak in the sheets.” (the Verge). Get your mind out of the gutter because that’s an impish reference to the drag racing log sheets that drivers use to keep track of their race times. All in all the Demon can runs the 0 to 60 mph in 2.3 seconds, and then onto 100 mph in a total of 5.1 seconds. This makes it tops for a production car. Oh and to briefly bring it back to Mr. Vin Diesel and the first Fast and the Furious film, the Demon does the quarter mile in 9.65 seconds — there’s your 10-second car, Dom. One of the things we at Endurance were intrigued by was that Dodge is offering three-year / 36,000 mile limited warranty, with five-year / 60,000-mile limited powertrain coverage. 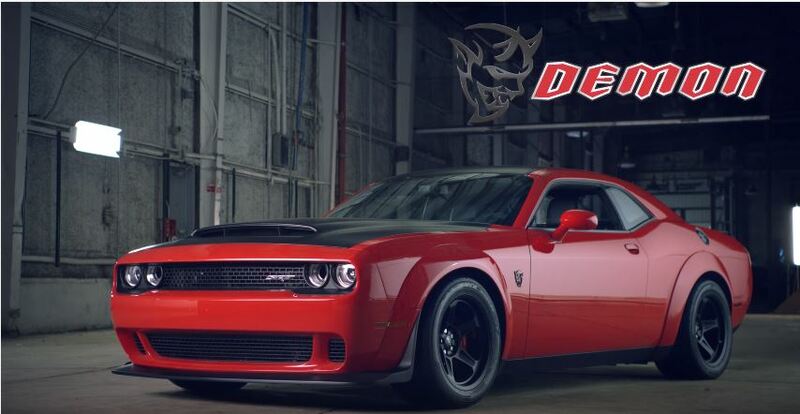 The Dodge Demon is set to race like a bat out of hell this fall, just in time for Halloween!